A very happy and prosperous New Year to all our readers. Below are the highlights of 2007 on Croatia Online. Easyjet are introducing a new route from Bristol to Split but both Wizzair and BA seem to have stopped their scheduled flights to Split. BA say that they are concentrating on Dubrovnik this year. We believe Ryanair will be returning to Zadar in the spring after suspending winter flights in their first year of operating the Zadar route. The elections in early November did not result in a clear majority for the leader of the party with the most seats, Ivo Sanader, so he is still in the process of trying to form an effective coalition government. Go to our earlier posting http://croatiaonline.blogspot.com/2007/11/croatia-on-line-elections-in-croatia.html for a more detailed report. The traditional Dalmatian fare of plain grilled fish and meat is great but it's good to have a change sometimes. 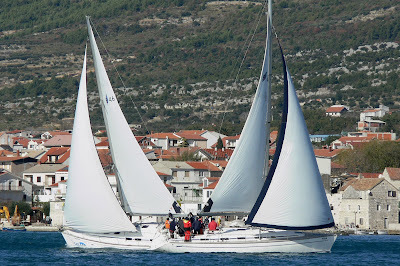 2007 was the year that Trogir got its first Chinese restaurant, a new macrobiotic restaurant came to Split and the Croatian Language School introduced a Croatian culinary course to complement the language courses in its summer schools in Losinj and Poreč. See http://croatiaonline.blogspot.com/2007/07/our-earlier-posting-on-cost-of-living.html for a report on what to expect compared with an earlier report in 2006. Re reading this posting it's already out of date as the cost of petrol has crept up so we'll be updating prices early in 2008.
Review our postings for a wide range of other topics including snakes in Croatia, a visit from the Royal Navy's HMS Cornwall, Split's new Riva (now being revamped again after public protest about several aspects of the first makeover), tourism news and much, much more. You can look forward to a similar wide variety of postings in 2008 and we hope you will add to the content with your comments and suggestions which are always very gratefully received. We've made a lot of new friends on this site and we hope that will continue in 2008.